Orientalist and Biblical scholar; born at Dörrenzimmern, in the principality of Hohenlohe-Oehringen, Oct. 16, 1752; died at Göttingen June 27, 1827. After studying theology and Oriental languages under Johann David Michaelis at the University of Göttingen, he was appointed professor of Oriental languages at Jena in 1775. Later (1788) he became professor of philosophy at Göttingen. After Michaelis' death (1794) he succeeded his former teacher as professor of Old Testament literature. This post he occupied until his death. The diversity of Eichhorn's studies and labors is remarkable, but his lasting merit lies in the field of Old Testament research. His "Einleitung in das Alte Testament" (3 vols., Leipsic, 1780-82) marks an epoch in the study of the Bible. 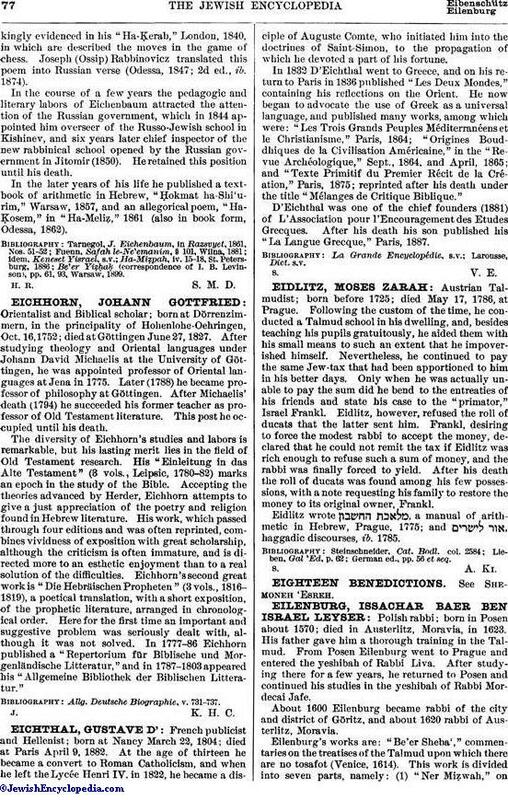 Accepting the theories advanced by Herder, Eichhorn attempts to give a just appreciation of the poetry and religion found in Hebrew literature. His work, which passed through four editions and was often reprinted, combines vividness of exposition with great scholarship, although the criticism is often immature, and is directed more to an esthetic enjoyment than to a real solution of the difficulties. Eichhorn's second great work is "Die Hebräischen Propheten" (3 vols., 1816-1819), a poetical translation, with a short exposition, of the prophetic literature, arranged in chronological order. Here for the first time an important and suggestive problem was seriously dealt with, although it was not solved. In 1777-86 Eichhorn published a "Repertorium für Biblische und Morgenländische Litteratur," and in 1787-1803 appeared his "Allgemeine Bibliothek der Biblischen Litteratur." Allg. Deutsche Biographie, v. 731-737.